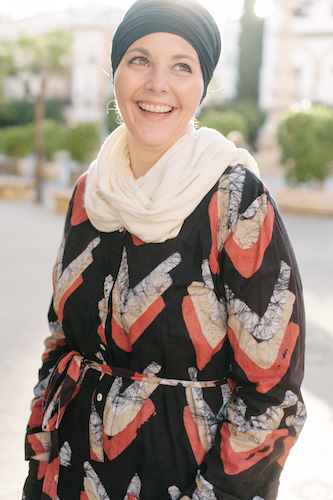 Planning to visit Morocco in spring and wondering what to wear? I’ve got you covered ladies! Many people assume that you really need to be all covered up to visit but this isn’t entirely true. I think it’s important to respect local cultural norms and not show off too much skin but you can still be fashionable and comfortable without being overexposed. 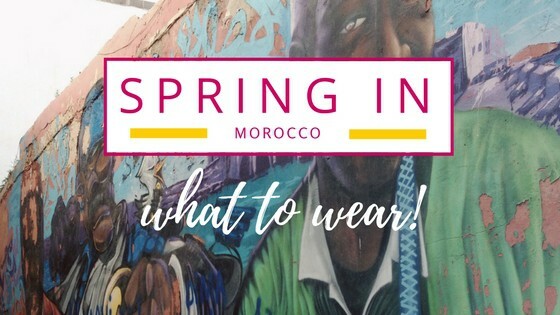 So if you’re wondering when is spring in Morocco and what to wear in Morocco in March, what to wear in Morocco in April, or what to wear in Morocco in May this is for you! (Hint: that’s when spring is!) Keep in mind you will want to check local weather for different parts of the country. A stay in Tangier will be different than if you’ll be in Agadir. 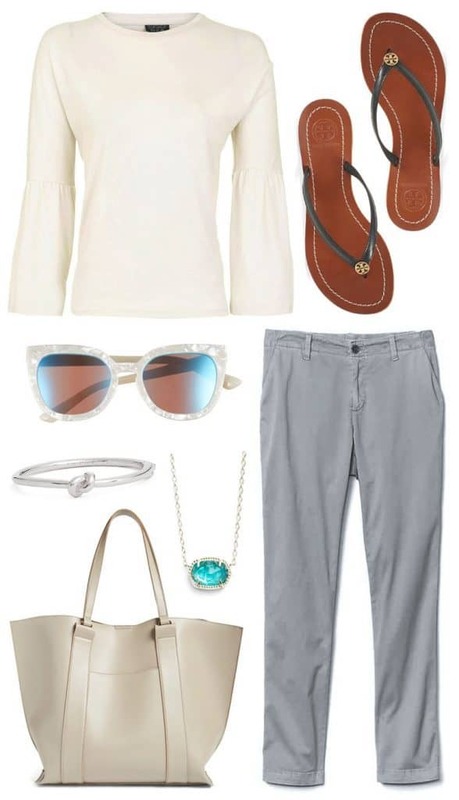 Girlfriend Cropped Pants I love this solution because you can still look really put together and stay cool. A higher pant length also means you won’t end up getting your pants dirty on the streets – it’s rare to see anyone here with pants that touch the ground. Bell sleeved tee: Look for looser fitting tops that have some coverage. The higher neckline on this piece keeps your chest covered and can be paired with a fun necklace for a little extra color. Tory Burch sandals: Nope it’s not too cold in spring for sandals so feel free to pack a pair! These are fashionable to wear out but still casual enough for poolside lounging. You also should pack a pair of closed toed shoes for days when you’ll be doing more walking or in rural areas. Tote bag: Morocco has a zero plastic bag law (though you’ll still find them here and there) so bring a big tote for all your shopping! 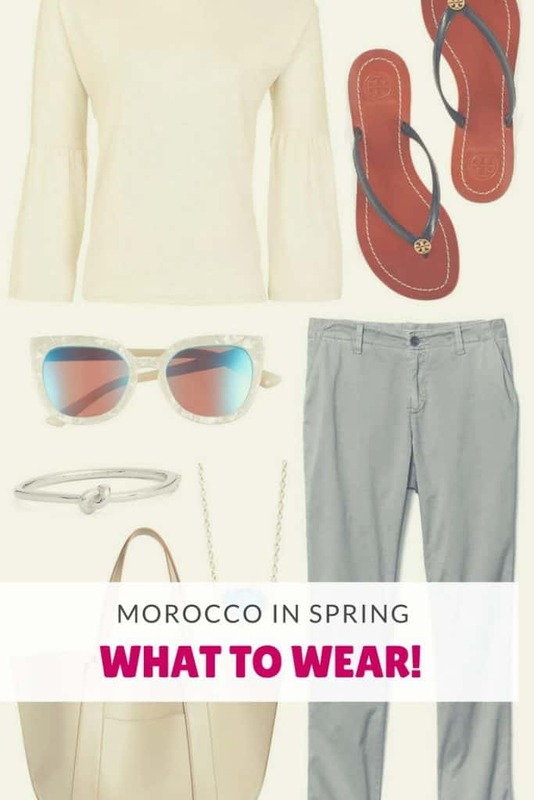 Sunglasses: Spring in Morocco means full on sun and yes, you will want at least one pair of sunglasses! Not only are they great for sun (obviously) but they also are a great decoy tool! Wear your glasses and look around without people really being able to see what you’re looking at! Kendra Scott necklace: Remember that cute necklace idea to pair with a shirt? Here’s an idea! Or you can pick up something fun when you’re out exploring the souks! Bangle: I’m a sucker for cute bracelets to dress up an outfit. Choose something simple and lightweight so as not to add to your luggage weight! Midi Skirt: I love spring midi skirts! They’re not so long that they drag on the ground and can work for a night out or day sight seeing. They are the perfect option for what to wear in spring when you want to better regulate your temperature. Three-quarter sleeve fitted shirt: I am a big fan of monochrome colors when I travel – especially blacks. They’re stylish and can be dressed up or down. This shirt paired with the skirt can be tucked in and worn as is or with a cardigan or jacket on top for cooler temperatures. Cardigan: Spring time temperatures are warm during the day but nights are still cool. You’ll want a cardigan or blazer on hand to take the chill off! Booties: Bring a pair of booties along for your wardrobe! Choose a color that can go with most of your outfits and add a pair of leggings or tights to your luggage to quickly put together another outfit without taking up a lot of space. Booties are also a great option when you’re wondering what shoes to wear with a midi skirt. Colorful Scarf: You can easily buy scarfs when you arrive but I think having one in your luggage makes for an easy transition. Wear it for a pop of color or an added accessory. Skinny or Fitted Jeans: Look for light weight jeans that won’t add bulk to your luggage and keep you cool when you’re outside. Ripped jeans are totally fine to wear, but you may want to avoid jeans with rips higher up – around the knees is ok.
Tunic Tops: Love these! Wearing shirts with a little more length can really help deflect any unwanted attention. Plus you can pair them with jeans or leggings for multiple outfits! Lightweight Jacket: Yes, I do suggest packing one! Bring something that is good for both colder temperatures and water repellant in case you find yourself out on a rainy day. You’ll especially want a jacket if your plans include a visit to the Sahara desert. Blazer: I always have a nice button up shirt, blazer, and tunic in my luggage – anywhere I go. These pieces can instantly transform an outfit and can be used interchangeably. Look for fabrics that don’t need to be dry cleaned and won’t wrinkle easily. Shoes – Flip Flops and Booties – Take those shoes from your other outfits and combine them here. I never pack more than three pairs of shoes if I can help it so make your shoes and outfits do double – and triple duty! I hope this gives you some ideas of what to pack and how to prepare for your time in Morocco!